Washington (CNN) - Mega Republican donor Sheldon Adelson will attend Mitt Romney's election night event in Boston Tuesday evening, CNN has learned. This caps a year in which Adelson and his tens of millions of dollars of political contributions have been front and center, drawing notoriety and controversy along the way. Watch CNN's comprehensive coverage of Election Day starting at 6 p.m. ET Tuesday on CNN TV and follow online at CNN.com or via CNN's apps for iPhone, iPad and Android. For up-to-the-minute results, go to cnn.com/results and for our real-time Election Day live blog, check out cnn.com/conversation. Need other reasons to watch Election Day coverage on CNN's platforms? Click here for our list. Adelson, along with his wife Miriam, will come "very close" to contributing $100 million this year towards defeating President Barack Obama and electing Republicans to Congress, insiders involved in the process told CNN. The multi-billionaire had told associates this year he was prepared to spend as much as $100 million to help achieve his political goals. 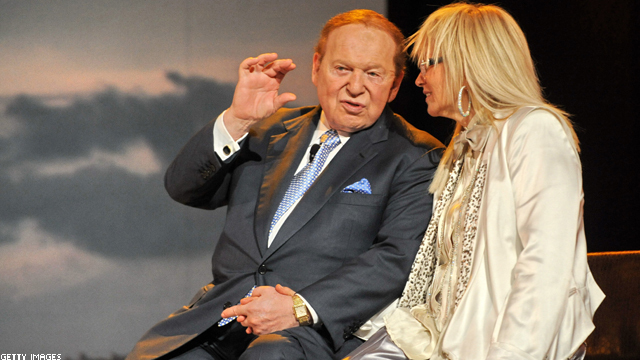 The Adelsons started off the year as the major benefactors of the super PAC Winning Our Future, which backed former House Speaker Newt Gingrich's run for the Republican presidential nomination. Their $15 million in donations was a major reason that Gingrich could keep his candidacy alive as long as he did and immediately drew public attention to the owner of the Sands Corporation, which operates casinos in the U.S. and overseas. His wife, a physician, also gained high-profile status in the political world. After Gingrich pulled out, Adelson faced questions about whether he would embrace Romney and to what extent. While the casino mogul had raised some doubts about Romney, those close to Adelson said there was never really any doubt he would back whoever became the Republican nominee. He fully embraced Romney because they both shared a mission: defeating Obama. To help support Romney's candidacy, the casino mogul and his wife gave $20 million to Restore Our Future, the major super PAC backing Romney's candidacy. He also traveled to Israel to attend events, including a fund-raiser, during the GOP standard bearer's summer trip there. One of his key priorities has always been to safeguard Israel and to support candidates he thinks would be best in helping guarantee its future. Estimated by Forbes Magazine to be worth more than $20 billion and the 12th richest man in America, Adelson drew a myriad of requests–once his political donating began–from a wide assortment of candidates, groups and interests. "It was massive," one source with knowledge of his donations told CNN. "People made up super PACs to try to convince him" to donate. The source said Adelson would get as many as 10-15 requests a day. "I have never seen anything like that...it became so overwhelming." Now that the campaign is drawing to a close, we are getting some insight into the political activities of this multi-billionaire. Adelson, who is known to jealously guard his privacy, has recently begun to open up a bit about his political activities and goals and defend his actions. In an op-ed in Monday's Wall Street Journal, he outlined his political journey. "As a person who has been able to rise from poverty to affluence, and who has created jobs and work benefits for tends of thousands of families, I feel obligated to speak up and support the American ideals I grew up with - charity, self-reliance, accountability. These are the age-old virtues that help make our communities prosperous. Yet, sadly, the Democratic Party no longer seems to value them as it once did. That's why I switched parties, and why I'm now giving amply to Republicans." As to how he decided which entities to support this year, he had specific goals in mind: He did not want his money just to pay for more television ads because they were so many already but instead wanted "to find the groups that moved the needle," said the source with knowledge of Adelson's donations. The source refused to speak on the record because he was not authorized to speak publicly about Adelson's donations. Of those individuals and groups requesting donations, "he was very clear to everybody..." he was "not just going to throw money" into organizations but would say to them "just prove you had a unique approach to the model" of achieving their aim, said the source. "He was not dictating how" the groups specifically should do their work - he never read an ad script for example but wanted to make sure they could achieve their goals, said the source. "We tended to take a look at the more unique and demographically focused so you are moving the people that matter," said the source. Specifically his aim was to help build support among two key constituencies: Hispanics and women. While some of his donations, according to the source, went to nonprofit, tax-exempt groups that don't have to disclose their donors, that is said not to be a primary motivation for Adelson. In addition to super PACs in support of presidential candidates, Adelson and his wife, who are ranked as this year's top donors to outside groups, have also given to several super PACs helping to elect Republicans to Congress and organizations pushing conservative ideas and candidates. Also receiving of some of Adelson's funds, according to the source with knowledge of his donations, were efforts organized by influential political activists Charles and David Koch, better known as the Koch brothers, and the Crossroads groups, co-founded by former George W. Bush White House adviser Karl Rove. You can judge a man by the company he keeps. Adelson, Koch brothers, and Karl Rove's Crossroads Super PAC must be considered co-owners of the Romney campaign because of the money contributions. The conservative wing of the US Supreme Court has allowed the highest bidders to buy politicians. Of course Adelson will be with Willard the Liar. He wants to personally take possession of his new property. Pay close attention to Willard's speech tonight, he will thank his donor (singular) and his supporter (also singular). The tax cuts Willard has PROMISED to make mean that Adelson's investment in Romney will pay off at about 4000 to 1. Of course to see what his money bought him........... got to keep a close eye on your assets. Bottom line he tried to buy the election this is not what democracy is all about if Romney was to win he would just be a puppet for him. Randy, San Francisco- George Soros, owner and Master Puppeteer of Obama administration ring a bell? What a total waste of money. Sad, really sad. They should they pay for the loser. He wants to see what his millions and millions of dollars he donated didnt get him. Priceless!! Perhaps the Chinese he is in with will close him down when he doesn't get the mony back from a poor investment. Maybe Sheldon will dial the phone number for Mitt when he concedes the election! I wonder if there will be a customer service desk where he can ask for a refund? What a joke and waste. So many hungry kids in the world and to throw that money away is just senseless. I think the reason why he is attending the event is because he wants to demand his money back after throwing so much to one of the biggest losers ever to run for the Presidency. I will not attend but I voted and that will cause you some grieves, so don't forget your handkerchief – it will be handy for your tears tonight. I plan to have my two dollar popcorn watching you agonize – the rich also cry. It's obvious he's made an investment. It a sad day in American when national elections can not be conducted fairly. You can not tell me that the Koch Brothers, The Adelsons and Karl Rove have the best interest for America. Just look at the federal violations by the companies associated with the Koch Brothers and the Republican platform and it's very clear why they are supporting Romney. The Federal government should take over national elections and standardize the process. What a pricey ticket!!!! But if Mr. Romney wins, he can say he bought the US government! Just watching his return on investment. he's trying to buy the election. this should not be allowed. Soros is a piker compared to what Adelson and the Kochs paid for Mr. Romney. Your party is the party of the 1% – face facts. Why would Adelson not attend? He owns Mitt Romney – every inch of him! He sees this as " collection " time. If Willard gets in he will collect enough to double or triple his donations and all the " sheep " that voted Republican will be responsible.